Luxurious and Elegant sums up Pear Condominiums at 35 Hollywood Avenue, minutes away from Yonge and Sheppard in North York. You will be welcomed with a dazzling lobby and it’s marvelous amenities such as an exercise center featuring an indoor pool and sauna, , converge, study, and even visitor parking and guest suits for your loved ones. Starting at 570 Sq Feet 1 bedroom suits going up to a 3 bedroom 1,500 Sq feet marvel, the tower is close to North York City Center, Sheppard Subway, Highway 401, Shopping and Toronto Center for the Arts. Contact Kirby Chan and get more information for buying and selling at 35 Hollywood Avenue. 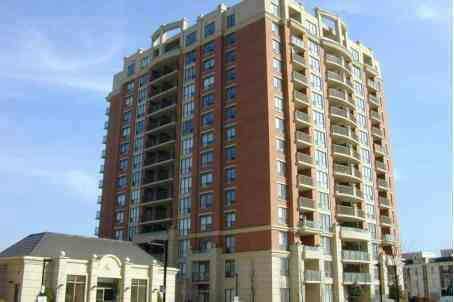 Categories: North York Condos | Tags: 35 Hollywood Avenue, North York, Pear Condominiums | Permalink. 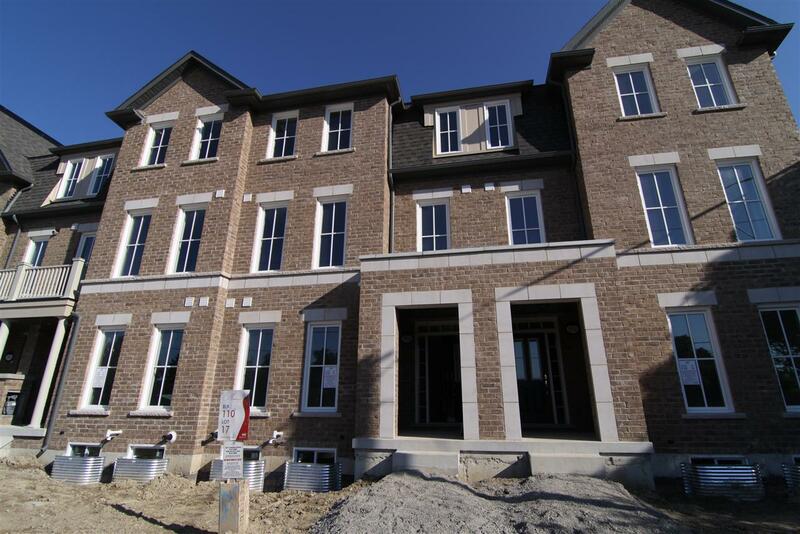 Now offering a luxurious brand new Monarch freehold townhouse with approx. 2300 Sq.Ft. It features 9 Ft. ceilings, great room with a fireplace, walk-out to a large terrace, upgraded kitchen cabinets and pantry, granite counters, breakfast bar, hardwood floors, stained oak staircase, direct garage access, A/C, garage opener, extra large garage (Over 20 ft. long). Also includes a full unfinished basement. Categories: Deal of the week, Listings | Tags: house for lease, how to rent out my house, looking for tenants, North York, properties for rent markham, richmond hill, thornhill, toronto | Permalink. 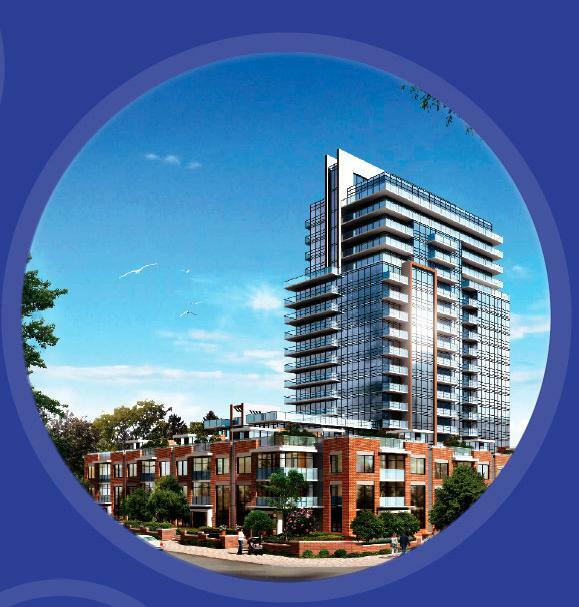 Celsius Condominiums is going to be a new Condominium in North York. The proposed occupancy date is March 31, 2014. The builder is the Shiu Pong Group, which began developing its portfolio in 1972, which now includes Dragon City, Dragon Centre, The Radius, Mapledale Condominiums, Garden Terrace Condominiums, Two Twenty Duncan Mill Condominiums, Victoria Park Business Centre, Bayview Royal Community and Campus 2000 and Lotus condominiums located in Toronto’s fashionable Yorkville neighbourhood. Energy efficient construction materials including, superior wall insulation, double-glazed windows, energy saving lighting and low volatile compound paints and adhesives. Shiu Pong exclusive central water purification system. Convenient, energy efficient “all off” lighting switch at suite entry. Celsius is nestled in a quiet residential neigbhourhood at Churchill and Canterberry Place just west of the of Yonge Street and south of Finch Avenue. Literally on your doorstep there’s endless shopping, dining, movies and cultural landmarks. Address is 31-45 Horsham Avenue. Parking: 1 Parking is included for units over 500 square foot. 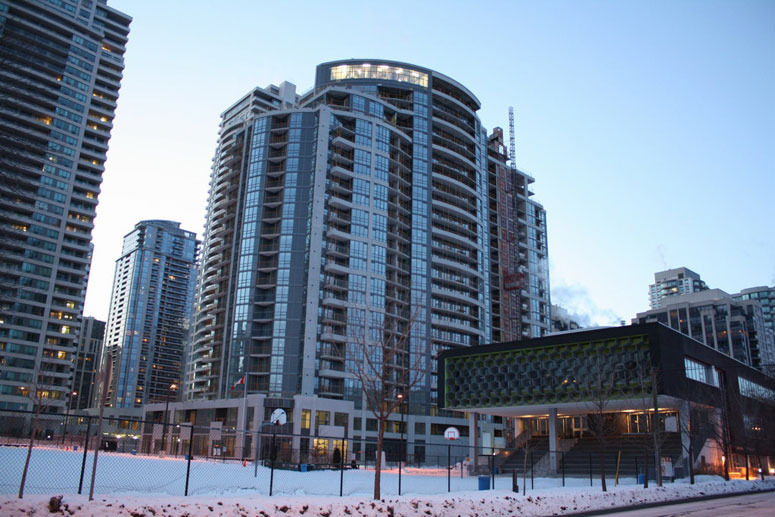 There will be 232 units (214 tower unit, 12 townhouse and 6 loft units) featuring 9-foot ceilings in principal living areas, laminate floors, marble vanity, granite counters, double sink and in-suite alarm. Sizes range from 472 square foot to 829 square foot. There are also a small number of townhouses surrounding the condominium building. Sizes range from 980 square foot to 1815 sq.ft. Categories: North York Condos | Tags: 1 bedroom for sale, 2 bedroom for sale, celsius condos, Celsius condos toronto, condo townhouse north york, condominiums north york, first time ho, investors condominiums, new condos in north york, North York, shiu pong builder | Permalink. From time to time I would point my clients to www.realtor.ca to do some of their own searches and to educate themselves. For basic property searches, www.realtor.ca serves it’s purposes very well. Overall I really like the www.realtor.ca site. But now there’s a new player in town, www.zoocasa.com. Combining listing information and mapping technology provided by Google Maps, Zoocasa.com allows users to personalize their search experience and discover community, demographic and lifestyle information to help them choose the right home. I searched for homes in the Yonge St/Major Mackenzie neighbourhood in Richmond Hill. 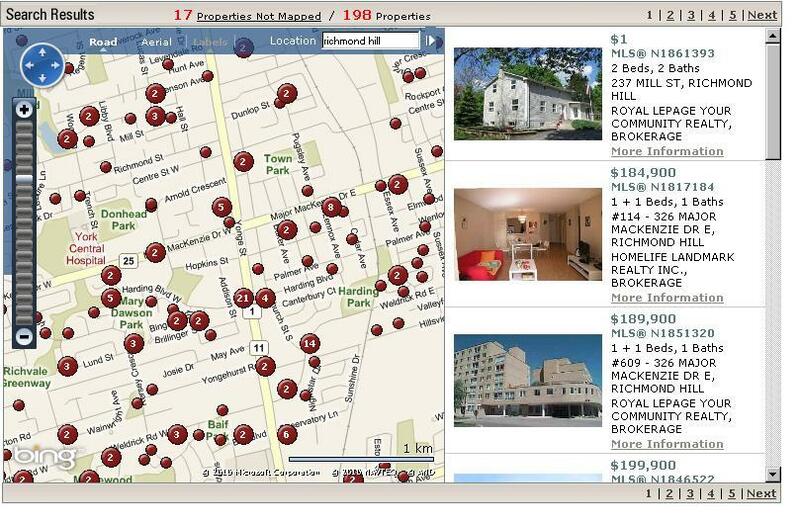 The familiar screen of www.realtor.ca plots the results on a map. Zooming in will pin point the exact location of the property. Clicking on the red dot will allow you to view the property listing. The results are all the listings that are on the MLS system. Zoocasa’s results are very clean and much more pleasing to the eye. However I noticed a strange anomaly. If you click on the photo, you can see there is one blue dot with 143 properties. After a quick investigation, I found that a lot of the properties were from elsewhere in the Richmond Hill. Maybe properties with no address were all lumped together at the center of Richmond Hill. 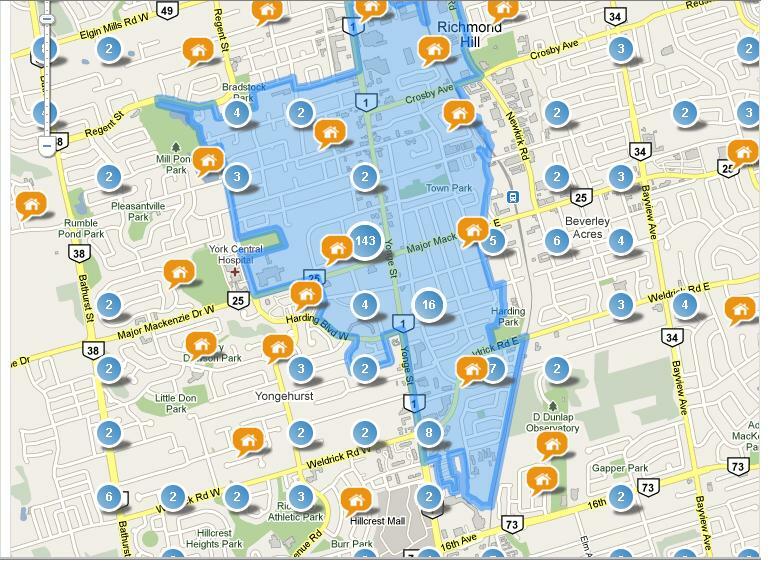 Other than that, the map search is very similar to www.realtor.ca. The results are taken from brokerages that co-operate with Zoocasa so if a brokerage did not sign up with Zoocasa than you would not see their listings on the site. The property listings for both www.realtor.ca and Zoocasa are nearly identical. Both have identical listing descriptions and interior photos. However, Zoocasa goes one step further and provides other tools for potential home buyers. Walkscore – amenities that are in walking distance. My conclusion is www.realtor.ca is great for basic property searches. www.zoocasa.com gives a more detailed search that is helpful with their array of tools. Thank-you for reading our article about “Zoocasa Review and Realtor.ca Comparison – May 18, 2010”, contact us if you need anything or leave us a comment below. Categories: Real Estate Articles | Tags: how to search for properties, learning to buy a house, looking for an agent, Looking for homes in toronto, markham, North York, reading mls listings, realtor.ca review, richmond hill, searching for properties, thornhill, toronto, zoocasa, zoocasa comparison, zoocasa review, zoocasa.ca, zoocasa.com | Permalink. I found it troublesome looking for the tax rates of several municipalities. So, here it is in a convenient chart. The tax rate and the assessed value of your property are used to calculate your property tax. If you have any questions than please email your favourite neighbourhood Realtor, Kirby and I will send you the relevant MPAC literature. Thank-you for reading our article about “2009 Property Tax Rates for GTA”, contact us if you need anything or leave us a comment below. Categories: Real Estate Articles | Tags: Ajax Property Tax Rate, Aurora Property Tax Rate, Barrie Property Tax Rate, Bradford Property Tax Rate, Brampton Property Tax Rate, Brock Property Tax Rate, Burlington Property Tax Rate, Caledon Property Tax Rate, Clarington Property Tax Rate, Collingwood Property Tax Rate, East Gwillimbury Property Tax Rate, etobicoke, Georgina Property Tax Rate, GTA, Halton Hills Property Tax Rate, King Property Tax Rate, Markham Property Tax Rate, Mill Rate, Milton Property Tax Rate, Mississauga Property Tax Rate, New Tecumseh Property Tax Rate, Newmarket Property Tax Rate, North York, Oakville Property Tax Rate, Orangeville Property Tax Rate, Orillia Property Tax Rate, Oshawa Property Tax Rate, Pickering Property Tax Rate, Richmond Hill Property Tax Rate, scarborough, Scugog Property Tax Rate, Toronto Property Tax Rate, Uxbridge Property Tax Rate, Vaughan Property Tax Rate, Whitby Property Tax Rate, Whitchurch/Stouffville Property Tax Rate | Permalink. First – do you have the financial resources? You should have at least five percent of the purchase price of a home for the down payment, but ideally should be more than 5%. Are there other priorities in your life e.g. starting a new business, which require your savings? If not, buying a home should be on your radar. How good is the cell phone reception? Access to schools, work, recreation, shopping centres, public transportation, cultural attractions, libraries, churches and hospitals. Heavy traffic can be noise nuisance and hazard for children. Distance from the unit to amenities, parking, walkways, roads, public transit. How well is the building soundproofed? Too many questions to answer by yourself? That is where my expertise can benefit you. If you are looking to buy your first home, let me guide you through this exciting process. First time home buyers guide. Categories: Real Estate Articles | Tags: benefits of home ownership, building equity, condo, condominium, condos, first time home buyers guide, forest hill, investment, key issues buying a home, kirby chan agent, lawrence park, luxury real estate, North York, questions buying a home, Toronto Real Estate | Permalink.